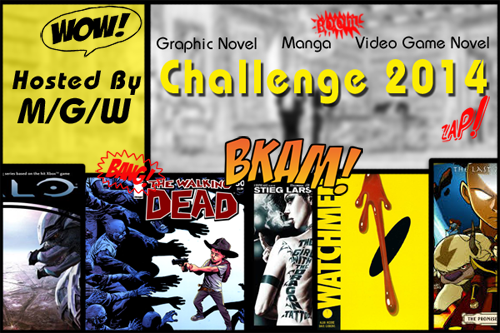 This is the first reading challenge of 2014 that I’m taking part in! It’s hosted over on M/G/W. Basically I’ll set myself a target amount of books/comics that I want to read. They have to be either comics, graphic novels or video game tie in novels. I like the sound of this challenge as it’s something abit different! Read a total of 12 books (1 for each month). Read a total of 15 – 25 books. Read a total of 25 – 35 books. Read a total of 35 – 45 books. Read a total of 45-50 books! I’m aiming for level one or two, as I’m taking part in other challenges this year! What challenges are you taking part in?! Let me know in the comments! Previous Post COVER REVEAL! City of Heavenly Fire! this year I’m trying to finish all the books on my TBR since the list (or at least the most in need of reading list) is pretty short. Good luck with your challenge, hope you enjoy it!